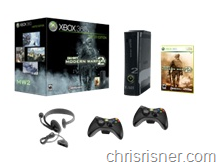 Today I unnecessarily ordered an Xbox 360. 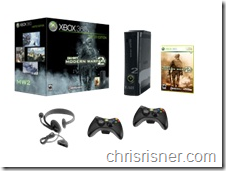 Not just any Xbox 360 though, the 360 Modern Warfare 2 Limited Edition one. As part of a Cyber Monday deal, for the same price as it had regularly been available ($399.99) it also came with Assassin's Creed 2, Dragon Age: Origins, as well as 3 free months of Xbox Gold membership. All together, it’s about a $550 value. If I finish these games quickly and pull an Atomic and sell the games, I can get my $399 xbox for just over $300. Was the order unnecessary? Absolutely. Do I regret buying it? Not until it’s time to pay the bills. Do I look forward to the day I pwn Atomic at achievement points? Paramount. At the moment the game orders are showing up as processing and the Xbox is showing up as Delayed (lame). When will my Xbox arrive? Who knows. If you get it within the next week grab Left 4 Dead 2 the current top co-op title. Borderlands is a close second. As for achievement points, Erin will shut you down long before you even get close to my score. I have the advantage of a TV addicted wife to allow me the required timesink. Likelihood of it arriving within the next week, not good.